If you can bench press your body weight and run a six minute mile, but you can’t kneel on the ground comfortably and efficiently, there’s a gap in your fitness, movement skills, and capability for real life. So, if you want to be fit for the real world, and develop your movement skills and fitness “from the ground up,” it’s really important that you learn how to kneel efficiently. Along with sitting and squatting, kneeling is one of the most rudimentary natural human movement skills, that unfortunately, most people struggle with. It’s best to learn how to walk before you learn how to run. Similarly, it’s usually best to learn to kneel before you learn other ground movements and positions. So, today, I’d like to teach you the Kneeling Get-up, which is an excellent movement for both beginners and advanced movers alike because it is highly practical and provides fantastic value for mobility and stability in the feet, ankles and knees. Kneeling down from standing, and standing up from kneeling is a common natural movement that is still done many times a day… in cultures where kneeling is still a natural thing to do. In our modern culture, most people will choose sitting on a chair rather than kneeling, and if you were to choose to kneel when chairs or seats are available, people would immediately feel uncomfortable and suggest that you sit instead. It is no surprise that we are losing joint mobility at an alarming rate in the modern world, not just because we do not squat enough any longer, but also because we do not kneel enough. 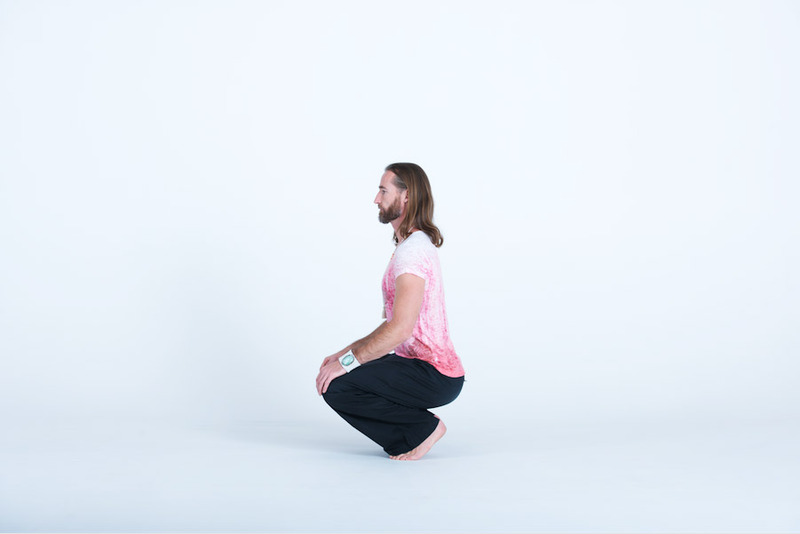 Foot, ankle, knee and hip mobility will rapidly regain function and comfort as you practice this simple standing to kneeling routine every day. Preferably, several times a day. This movement is not only excellent for your joint mobility, but also for your joint stability and balance. If you do it mindfully and in a controlled manner, you don’t need to get started on a soft floor. In fact, a firm surface will give you more stability and force you to control your balance. It is the transition that really matters, and that is the most challenging when performed without support from the arms. It takes place between the deep knee bend (photo #2 below) and flexed-foot kneeling positions (photo #3 below). Beyond reaching the deep knee bend, one can stand, or jump, or start crawling for instance, and beyond reaching the kneeling stance one could transition to moving on all fours, or sitting, rolling or lying, etc. Kneeling can be done with or without hand support. From a practical standpoint, it is highly desirable to be able to do it without hand support, as your arms could very well be occupied carrying equipment, a child, or aiming at something in a tactical situation. However, for practice and progression purposes, using one’s hands on the ground to assist the movement is basically the same principle as a “training wheel”, which a great way to reduce the load onto the feet, ankles and knees when they are not functionally ready to handle your full bodyweight due to a lack of mobility, stability, or both. So, while I describe the movement “hands-free” below, keep in mind that it is not only OK to practice with the assistance of your hands and arms, it is actually a great way to “regress” the movement to a sustainable level that will enable you to progressively develop the mobility and stability you need in your lower joints. When assisting with the arms, it allows you to reach forward with the arms to get down in a sliding forward motion onto the knees until reaching the final kneeling position…which is kind of fun (kids do it all the time!). Are you ready to try it? If you’re unfamiliar with the movement, or can’t remember the last time you did it or how well it went, try it first by using your hands for support, and see how it feels. And keep in mind that you should maintain a tall posture, relaxed arms, and ample breathing at all times. Step 1) Lower yourself from standing by squatting down before transitioning to the deep knee bend. Alternatively, you can start directly in a strong, stable deep knee bend position. Your center of gravity should be optimally stabilized vertically over your base of support (that’s your feet right now), without significant oscillations. “Posture up”, maintain a forward line of vision, hands resting on your thighs and with your arms relaxed while maintaining controlled abdominal breathing. Step 2) While maintaining great stability in your feet and ankles, start driving the hips forward to lower the knees while leaning the upper body backward. A slight shifting of bodyweight in opposite direction (the upper body slightly leaning backward as the lower body shifts forward) will allow you to stay balanced with equal distribution of bodyweight over your base of support through the whole motion. This is how you can bring the knees smoothly to the ground while avoiding any counter-balancing with your arms, or slamming your knees hard on the ground because you are losing balance. Establish the flexed-foot kneeling position. 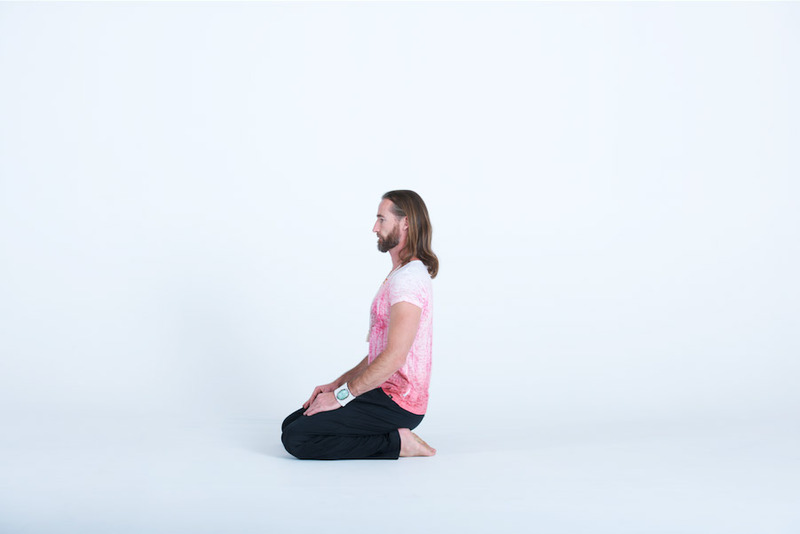 Step 3) From there, slightly lean forward with your torso to shift some bodyweight onto your knees so that you can slide and extend your feet horizontally below your rear, then lean back and sink into the kneeling position with a tall posture, arms relaxed, and hands still resting on the thighs. Alternatively, the final position could very well be the flexed-foot kneeling position (see photo #3 above). The Kneeling Get-up starts and finishes in the standing position. Getting back to standing is pretty straightforward: simply reverse the sequence. Lean slightly forward just enough to have the clearance you need to bring the ball of the foot onto the ground in the flexed-foot kneeling position. From the flexed-foot kneeling position, there are two options to facilitate a smooth transition to the deep knee bend. The first is to lean the torso backward enough to shift your bodyweight backward and start elevating the knees off the ground. The second is to first lean forward again to elevate the rear to a bit tall(er) kneeling position, then to sit back on the ankles in a swift motion that creates enough momentum to elevate the knees off the ground as well. If you’re on a hard surface, find something comfortable to kneel onto, such as a carpet, gym mat, or some nearby grass. Use something you can hold on to (a fence, a small tree etc..) to assist your transition from standing to the deep knee bend. When you’re first learning the movement, use your hands as “training wheels” to support some of your body weight. But try to support yourself less and less with the assistance of the hands each time you get down or up. A great way to mindfully practice your balance and joint stability is to perform this routine very slowly. The transition from the deep knee bend (photo 2) to the flexed-foot kneeling position (photo 3) and back to the deep knee bend being the most delicate. It can be isolated as an individual drill. Another variation of this movement is to do it dynamically. Or, alternate going fast and slow. Finally, you may also hold each position for several seconds. Kneeling is one of those practical movements most people could or should perform every day, and one that would make life a lot easier sometimes. And yet, most people have trouble with it, even though it’s one of the most basic human movements. The good news is that it doesn’t take too much practice to groove this new skill. So, if you practice the Kneeling Get-up a few times a week, you’ll be well on your way to making this simple move “second nature,” which is how it should be for all healthy, fit humans.